Minnesota winters and summers are beautiful; however; they can be extreme. Modern Heating and Plumbing can keep your family and home comfortable, no matter what the weather is doing outside! From heated floors, to reliable, controlled heating and cooling comfort, to remarkable efficiencies with whisper quiet operation, Modern Heating and Plumbing has the products and licensed, insured, factory trained technicians you deserve. Are you spending too much on your heating and cooling bills? A programmable thermostat, a higher efficiency furnace or air conditioner, a heat pump, off peak electric heating…can all help you reduce your utility bills. Check out the links below to explore some of the products we offer, or better yet, stop by our business and showroom to visit with our experts and get a proposal. “For Your Family’s Comfort,” we are here to answer your questions, help you choose the proper equipment and install them in your home or business. Be smart about your money…hire licensed, insured professionals! There’s an exciting, new face in the hot water home heating family meet ECO by Weil-McLain. ECO is among the highest Annual Fuel Utilization Efficiency (AFUE) rated boilers. Other boilers, current and past, have an AFUE of 55 to 80%. The new ECO is 95% energy efficient which exceeds Energy Star requirments! This efficiency rating makes the new ECO eligible for energy rebates and tax credits. ECO boilers, featuring durable stainless steel fire tube heat exchanger, can be wall or floor mounted and come in several heating capacities, all of which are modulating to keep any size home comfortable. Today, people are finding new and better ways to connect their lives. Honeywell’s exclusive RedLINK wireless technology and their full suite of wireless enabled comfort systems let you remotely control your home comfort. Connect any RedLINK Comfort System to the internet and you have remote access from your smart phone, PC or tablet. You can count on Honeywell’s commitment to innovation and technology to keep you on the leading edge. “For Your Family’s Comfort,” call Modern Heating and Plumbing at 218-847-7459. How Can Off-Peak Heating with ETS Save You Money? Why Choose Mitsubishi Heat Pumps? No ductwork? No problem! With Mitsubishi mini-split air conditioners you can cool and heat your entire home or just one room at a time. Ductless cooling and heating technology offers a welcome alternative as it focuses on individual rooms and living spaces rather than on a central air system. Mitsubishi products reduce energy costs and easily solve problems such as hot/cold rooms, additions/renovations, enclosed patios, homes without space for ductwork and larger, multi-zone living spaces. With a wide variety of indoor and outdoor unit capaci- ties, Mitsubishi ensures exibility to meet all your comfort needs. Mitsubishi is energy ef cient, problem solving, increases indoor air quality, and oh so quiet. Call Modern Heating and Plumbing at 218-847-7459! An air conditioner’s filters, coils and fins require regular maintenance for the unit to function effectively and efficiently throughout its years of service. Neglecting necessary maintenance ensures a steady decline in performance while your energy use increases. One of the most important and easiest tasks, which help the efficiency of your system, is to routinely replace or clean filters. A clogged, dirty filter blocks normal air ow and reduces a system’s efficiency. When normal airflow is obstructed, air that bypasses the filter may carry dirt directly into the evaporator coil and impair the coil’s capacity. Some filters are reusable so need to be cleaned while others need replacing. An air conditioner’s evaporator coil and condenser coil collect dirt over their months and years of service. Dirt in the evaporator coil insulates the coil and reduces its ability to absorb heat. Dirt and debris in the outdoor condenser coil can cause the condenser compressor to overheat and not breathe. The fins on the evaporator and condenser coils should not be bent as that also reduces airflow. An air conditioning system’s refrigerant charge should be checked, as well as, the condensate line and blower motor. These components are also part of regular maintenance. ”For Your Family’s Comfort,” check with us today for a free estimate on your home comfort system. Call us at 218 847 7459! 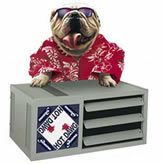 A Hot Dawg vented Modine unit heater chases away the cold in any space…new or old! This low profile heater can be installed as close as one inch from the ceiling in any garage or building. Burning on natural or propane gas, a Hot Dawg has a permanently lubricated motor and a full 10 year warranty on the heat exchanger. “For Your Family’s Comfort,” give Modern Heating and Plumbing a call!